from left to right: Simon Marklew (SW&L Managing Director), Wilfred, Adrian Brown (St John’s teacher), Chloe, Rachel Boskett Williams (St James’ teacher), Dylan and John Rogers (SW&L Chief Executive). 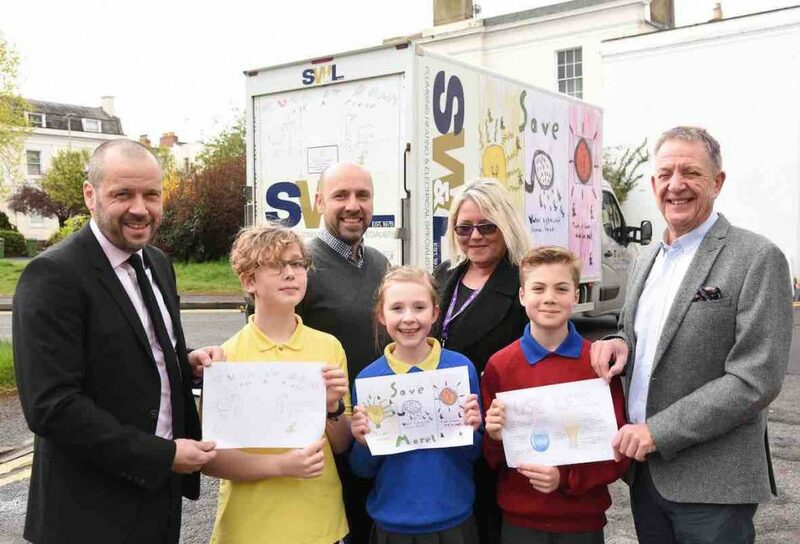 Cheltenham-based plumbing, heating and electrical specialists, SW&L, ran a drawing competition for two local primary schools and the winning designs have been printed on the company’s delivery van. SW&L invited children from Saint John’s and St James’ primary schools to take part in a colouring competition during Big Energy Saving Week, which raises awareness about using energy more efficiently. The Year 6 pupils were asked to draw a picture showing how to save energy at home. Dylan from St James’ and Chloe and Wilfred from Saint John’s were picked as the winners with their colourful drawings encouraging people to use less and save more. Each winning entry has been recreated on a side of the SW&L van, and each child received a £50 Love2Shop voucher. Both schools were also gifted with £250 from SW&L for taking part. “It was such a special moment when the children saw their drawings on the van for the first time, it’s absolutely huge!” says John Rogers, Chief Executive at SW&L. “We had some excellent entries; the children went to so much effort and we were thoroughly impressed.